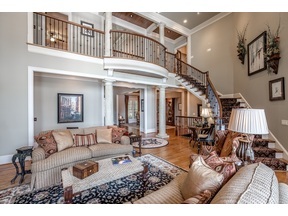 SPECTACULAR WATERFRONT ESTATE IN REYNOLDS LAKE OCONEE. NOW AND AGAIN A RARE AND MEMORABLE HOME IS OFFERED FOR THE CONSIDERATION OF THE MOST DISCERNING BUYERS. A HOME THAT OFFERS THAT RARE OPPORTUNITY TO SECURE THE BEST OF ALL THE ELEMENTS THAT ARE NEEDED TO CREATE THE IDEAL HOME. SITUATED ON THE THE COVETED RICHLAND CREEK SIDE OF LAKE OCONEE, THIS 5 BEDROOM 5 & 2 HALF BATH HOME FEATURES SOARING CEILINGS, A FLOWING FLOORPLAN SPREAD OUT OVER 3 LEVELS AND EXTENSIVE WINDOWS THROUGHOUT THE HOME TAKING IN THE SWEEPING VIEWS TO LAKE OCONEE. AFTER A TOTAL RENOVATION IN 2011, THIS EXTRAORDINARY HOME SHOWS LIKE NEW AND FEATURES UNPARALLELED DESIGN, MATERIALS AND CRAFTSMANSHIP THROUGHOUT. THIS HOME WILL EXCEED THE LOFTIEST OF EXPECTATIONS. GOLF MEMBERSHIP AVAILABLE.